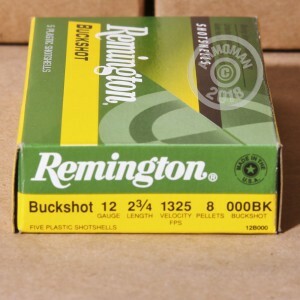 The 12 gauge, 2 3/4" shells in this case of 250 from Remington feature 8 densely packed pellets of 000 buck for devastating power against deer. 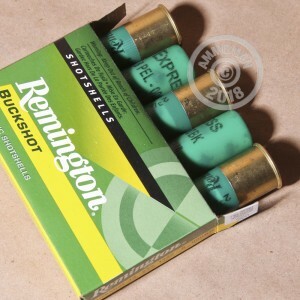 Packed in 50 boxes of 5 shells each, they achieve tight patterning through an "express" load that propells the pellets to 1,325 feet per second as well as Remington's cushioning and buffering technology. 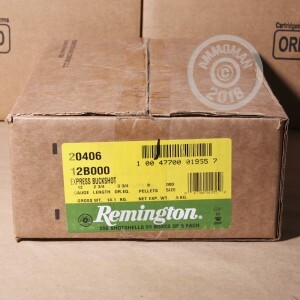 They will also work great on the range and make large-visible holes in targets. Slightly larger than 00 buck, 000 buck measures .36" (9.1mm) in diameter and is suitable for self-defense use in sparsely populated areas or against medium sized game. Buy this case or any other items totaling over $99 to receive free shipping on your order. AmmoMan.com's free shipping promotion saves you money and makes our prices transparent. You pay no more than the list price, which is displayed up front in each item listing.